Dr. Deborah Poff has been appointed a Member of the Order of Canada. Dr. Poff, who served as the 16th President and Vice-Chancellor of Brandon University (BU) from 2009–2014, was among 113 new appointments announced today by His Excellency the Right Honourable David Johnston, Governor General of Canada. 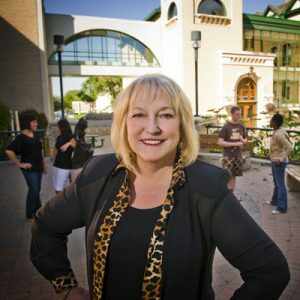 Dr. Deborah Poff, who was BU President and Vice-Chancellor from 2009-14, has been named to the Order of Canada. “It makes me feel very proud,” Dr. Poff said, adding that it was BU’s dedication to Indigenous education that first attracted her here. “The commitment to Native Studies was one of the reasons I wanted to go to BU,” she said. During her tenure at BU, Dr. Poff also led the University’s BUILD campaign, securing funds for the BU Physical Plant and for the Healthy Living Centre. But she says her most lasting memories aren’t of the bricks and mortar. “One of the greatest things was when our Chancellor, Dr. Michael Decter, established a scholarship for Aboriginal students in my name,” she said. “I can’t think of anything more meaningful. Dr. Poff said another fond memory was from her final Covocation, when Aboriginal students presented her with a star blanket in the university colours. “That hangs in a very prestigious place in my home,” she said. “Students and the community benefitted from her commitment and contributions. It is wonderful that Dr. Poff has been honoured and recognized through her appointment to the Order of Canada,” said Dr. Gervan Fearon, current BU President and Vice-Chancellor. Two other of today’s appointments also have BU ties. The Honourable Warren Winkler, a BU alumnus from 1959, was appointed an Officer of the Order of Canada “For his contributions to the advancement of Canadian labour law and for making the justice system more effective and accessible as former chief justice of the Ontario Court of Appeal.” He was given an honorary degree from Brandon University in 2007. The Honourable Sharon Carstairs was also appointed a Member of the Order of Canada “For her public service and for her work as a champion of palliative care.” The former Senator was a recipient of a BU honorary degree in 2003.